Valley’s Kayden Mollette handles the basketball in the backcourt. Valley’s Tanner Cunningham stands on the right wing. Valley’s Connor Fell launches a three-point attempt. WAVERLY — Performing in all areas and facets of anything that one does in life is important. However, even if the little things are executed to a great degree, the ball still has to go through the net in the game of basketball. And while the Valley Indians’ boys basketball program did a splendid job of executing in the so-called “little things” in the opening half while hitting shots to go along with it, AJ Phillips’ group went cold in the second half as Valley connected on just a single field goal, allowing the Sardinia Eastern Warriors’ boys basketball program to break a 24-24 halftime deadlock and hand the Indians a 53-38 defeat in a Division III Sectional Semifinal contest on Tuesday evening at the Downtown Arena in Waverly. For AJ Phillips, the lack of offensive execution simply came down to fatigue. After both teams traded the lead four times over the initial 4:42 of the affair, Valley played arguably its best basketball of the contest over the remaining 3:18 as the Indians blended in strong perimeter play with committed drives to the rim. When Kayden Mollette knocked down a trifecta from the right side, Valley took off on a 8-2 run that ultimately also featured a second trey from Andrew Shope and a brilliant save/rifle pass all in one by Tanner Cunningham to Mason Zaler for a finish down on the left block to take a 12-7 first-quarter lead. Brady Lykins then got on the board by adding in an and-one finish in the middle of the lane as Valley took its largest lead of the contest, 15-9, with 6:54 to play in the second quarter of action. While Eastern Brown — who relied on the three-ball almost exclusively in its halfcourt sets throughout the affair — took the lead back with a 14-5 spurt, Cunningham, a three-sport athlete with loads of potential, used his driving ability and the crafty use of his frame to drive inside. 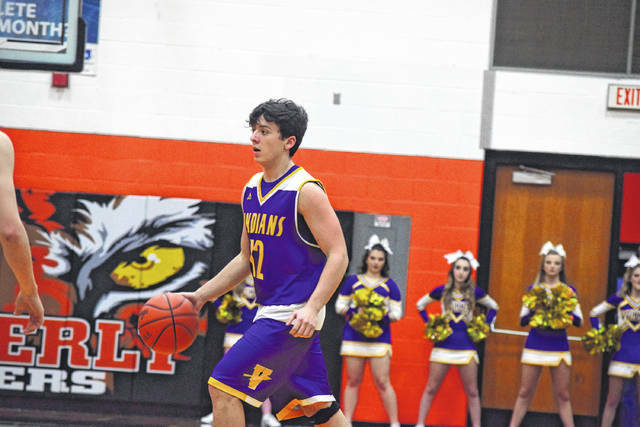 The junior swingman ultimately scored seven consecutive points for Valley as the Indians rallied back to take a 24-23 advantage late in the half before Colton Vaughn hit one of two free throws to knot the score at 24 before both units entered their respective locker rooms. ”I thought that Tanner was very patient today with the basketball, and got his shots when he wanted,” Phillips said. “He got the right mismatches and he took advantage of them early. But as promising as the first half was, the second half proved to be as equally frustrating as the first half was promising. 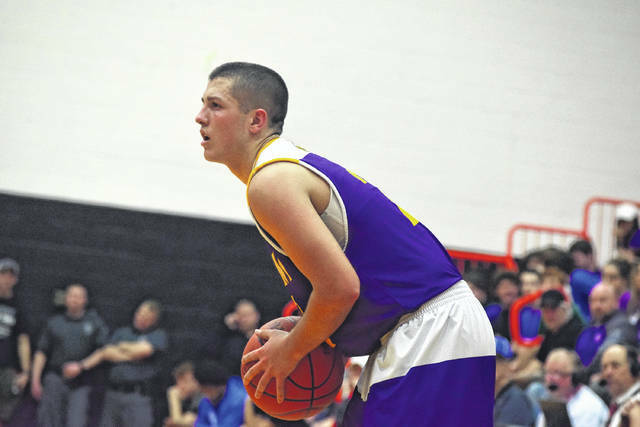 Eastern Brown, who connected on five three-point attempts, got going on three-pointers from Hunter Ruckel and Garyn Purdy as the Warriors built their lead up to a double-digit margin. Buckets from Dare Minton and Titus Burns added to the spurt as several ins-and-outs, along with misfired passes, kept the Indians from scoring until Cunningham hit the second of two free throws to end a 6:36 scoring drought. Eastern Brown ultimately took a 38-27 third-quarter advantage as a result as Valley’s three third-quarter points all came from the charity stripe. Still only down 11 even after the rough quarter, Lykins immediately got himself back to the free throw line to start the fourth quarter and nailed a pair of free throws to cut the lead to single-digits. Then, after a pair of free throws from Purdy, a bobbled rebound by Eastern Brown was collected by Cayton Ruby, who was wrapped around like an adolescent holding a teddy bear. The resulting foul — which was rightfully ruled intentional — allowed Valley to get the ball back after Ruby’s pair of free throws, which the senior made. But down by just a 40-31 count with just over seven minutes to play, a turnover ultimately crushed that momentum as Burns ultimately drew a foul after stealing a pass. When Mollette hit a pair of free throws and the Indians followed that up with another stop to have a second try at cutting the lead down to seven from a 42-33 deficit, two consecutive turnovers and a missed shot proved to seal Valley’s fate as a runout basket from Minton and free throws from Vaughn and Purdy put the game out of reach. With the defeat, Valley finished the season with a 4-19 overall record. 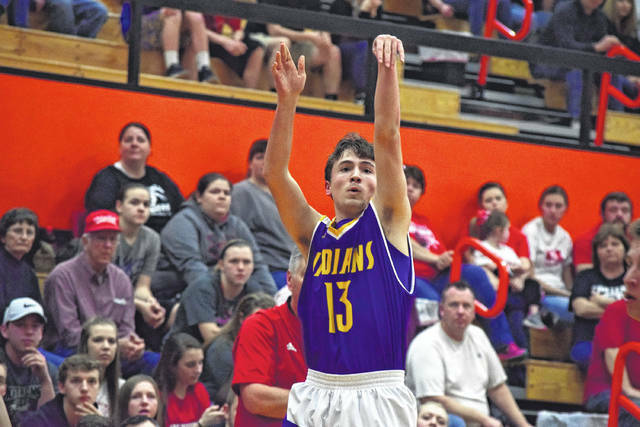 The Indians will lose three critical components from this year’s unit, including double-digit scorer Brady Lykins and multi-sport standouts Cayton Ruby and Tucker Williams, who were contributors with their willingness to accept different roles for the team. However, Cunningham, Fell, Mollette, Shope, and Zaler, among others, all return, which gives Valley a great nucleus with which to build on. Cunningham and Shope will be seniors while Fell, Mollette, and Zaler each have two seasons left to play.